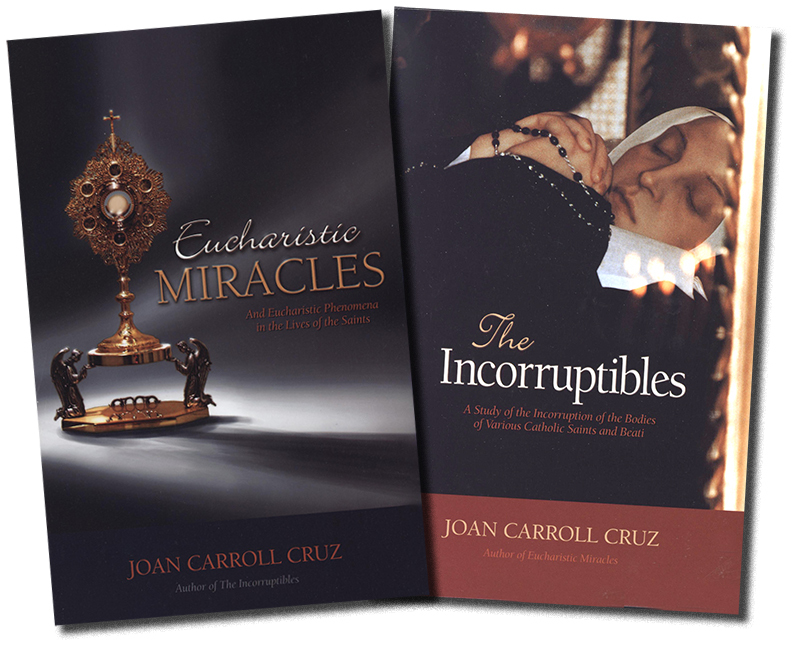 Two popular books by Joan Carroll Cruz as she shows some of the every day miracles in the Catholic Church. Eucharistic Miracles: The story of 36 major Eucharistic Miracles from Lanciano, Italy in 800 to Stich, Bavaria in 1970. Details the official investigations. Tells where some are still venerated today. Covers Hosts that have bled, turned to flesh, levitated, etc. ; plus, of Saints who have lived on the Eucharist alone. Reinforces the Church's doctrine of the Real Presence of Jesus in the Blessed Sacrament like no other book!Copyright 1987. Approximate dimensions: 5.5 x 8.5 inches. Sofcover. Imprimatur. 330 pp. The Incorruptibles: The incorruptible bodies of saints are a consoling sign of Christ's victory over death, a confirmation of the dogma of the Resurrection of the Body, a sign that the Saints are still with us in the Mystical Body of Christ, as well as a proof of the truth of the Catholic Faith for only in the Catholic Church do we find this phenomenon. Copyright 1977. Approximate dimensions: 5.5 x 8.5 inches. Sofcover. Imprimatur. 298 pp.